How to combine two audio files into one online? Many people would like to merge audio files into one, especially MP3 audio files. By joining audio files into one big file, you could freely enjoy several audio files in one file. You don’t need to open audio files one by one. In this guide, you will learn how to combine 2 audio files into one online and how to merge audio files offline with the best audio merger software. You could turn to various online audio joiner tools to merge and join 2 audio files into one file online for free. By searching online audio joiner or online audio merger on Google, you could get multiple options. Here we would like to take Audio Joiner as an example to show you how to combine 2 audio files into one online for free. 1. Visit the website audio-joiner.com. 2. 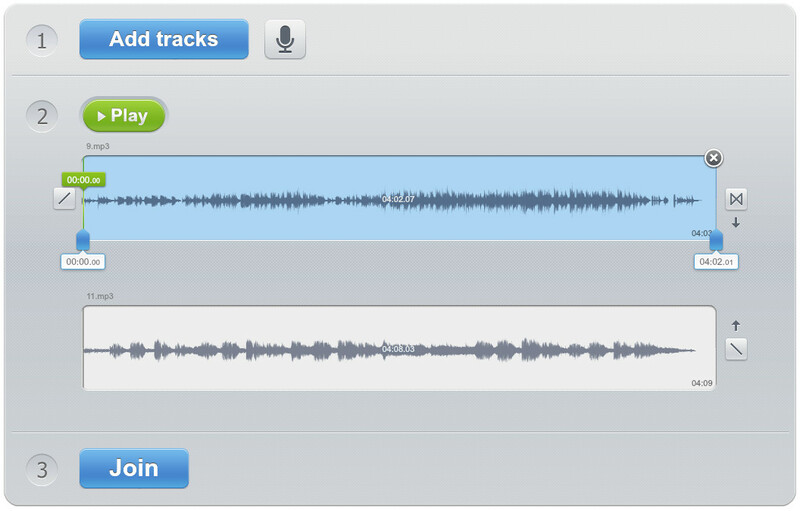 Click the “Add Tracks” button to browse and upload audio files you want to merge into one. 3. Then you could view the uploaded audio files on the page. You could then decide to cut audio files by moving the limiters on each audio file. 4. Also, you could play back uploaded audio files by clicking the “Play” button. 5. Finally, click the “Join” button. This online audio merger would start to join audio files. 6. After merging, you will be provided with a “Download” button, by clicking which you could get the merged audio file downloaded to your computer. When the downloading finishes, you then get the merged audio file as you like. Online audio file merger tools are generally free to use. However, it highly depends on the Internet connection, and most online audio joiner tools have limitation in file size. Therefore, we would like to recommend you another audio merger – Leawo’s Video Converter, a professional video converter software program that enables you to convert audio and merge audio files into one file. Leawo Video Converter, as mentioned above, could perform as a professional audio file merger to merge several audio files into one file. It has no limitation on the source audio file size. It is easy to use and quite practical in audio merging. Download and install Leawo Video Converter on your computer and then follow the below steps to learn how to combine audio files into one with this audio joiner software. Launch Leawo Prof. Media and then open the “Convert” module. Click “Add Video” button to browse and add audio files from local drive. Then, click the “Merge all files to one” button next to the big green “Convert” button to merge all loaded audio files into one. By re-clicking it, you could then merge file to separate files. On the main interface, click the button before the big green “Convert” button and then choose “Change” option to enter the “Profile” panel, where you could choose output audio format from “Format > Common Audio” group. 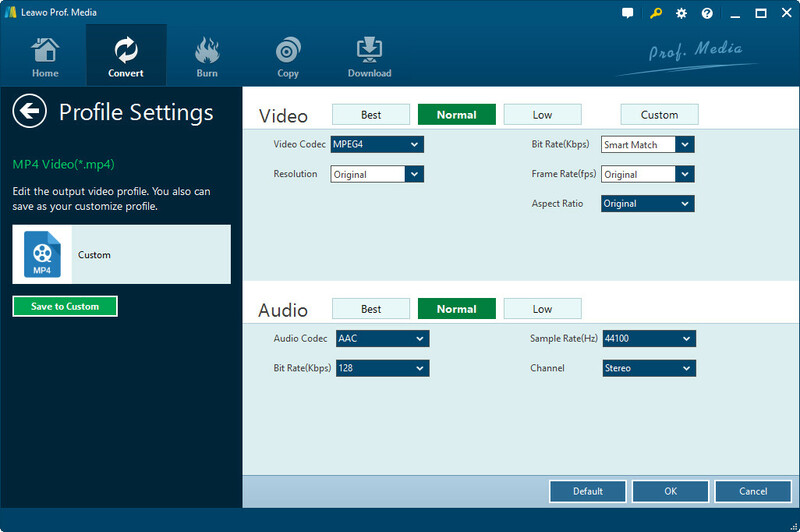 You could even edit the parameters of selected audio profile, including audio codec, quality, bit rate, channel, etc. To do these, re-open the drop-down panel right before the big green “Convert” button and then choose “Edit” option to enter the “Profile Settings” panel, where you could adjust these parameters. Return to the main interface and then click the big green “Convert” button. On the popup sidebar, set output directory in the “Save to” box. After setting output directory, you then click the bottom “Convert” button to start converting. 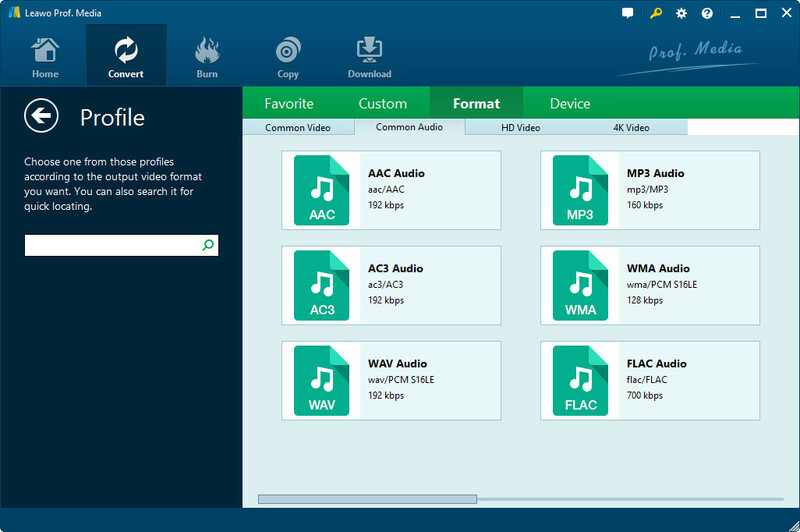 Leawo Video Converter would immediately start to convert audio files into one file. After the conversion, you will get one big file that’s combined from all audio files you’ve added to this video converter software. You could then freely make use of the audio file as you like. Compared with online audio joiner tools like Audio-joiner.com, Leawo Video Converter is without doubt much more powerful since it doesn’t require Internet connection and has no limitation in file size. Also, it enables you to convert multiple audio files in different formats into one audio format.